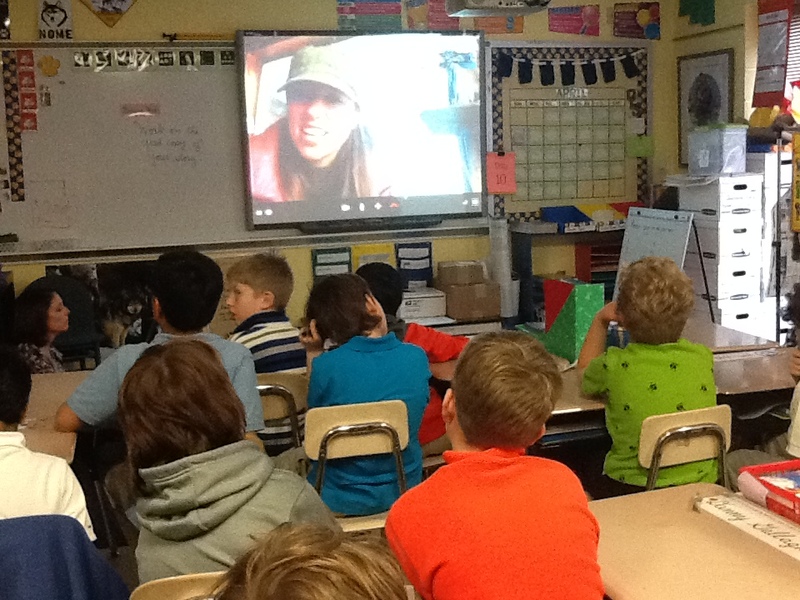 We had the chance to catch up with Monica Zappa via Skype last week! 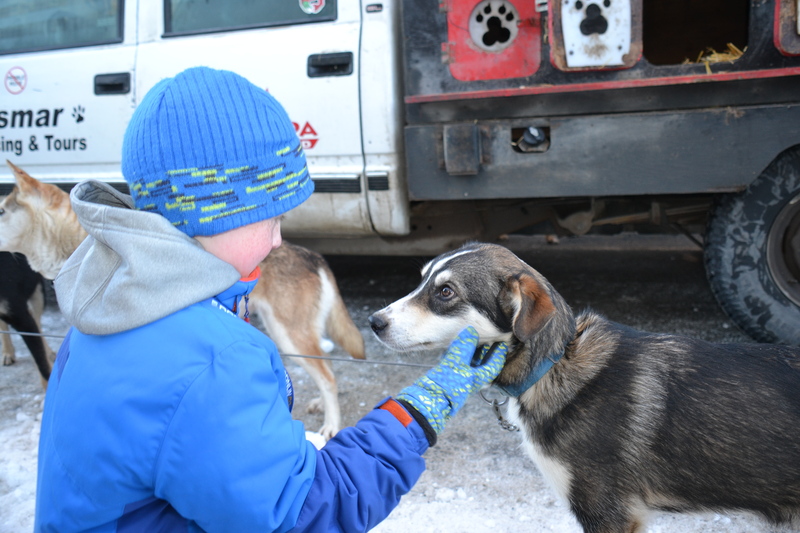 She joined us from her home to tell us about “life after Iditarod!” The boys were so excited to talk to her and had some great questions for her. She even introduced us to Dweezil, the superstar puppy! Dweezil has become somewhat of a rockstar on social media sites, and my own son met (and instantly fell in love with) him at the Ceremonial Start in Anchorage, but the boys hadn’t heard his story so that was as good a place as any to start! When Monica left to go out on the race, Dweezil started to get sick, really sick. No one could seem to figure out what was wrong with him. When Tim left home to head to Nome to meet Monica, he got even worse. He was super weak and got to the point where he couldn’t even walk! No one has ever really figured out what was wrong with him, but since Monica and Tim have been home, he’s been getting stronger and stronger every day and is walking a bit further every day! The boys and Monica discussed just how much dogs are in tune with what is going on in their surroundings and how much they need the companionship of their fellow dogs and their humans. The boys seemed pretty convinced that Dweezil was depressed being left behind and that may be why he got so sick. It reminded me of being in Nikolai with the dropped dogs and sitting with them while they howled and howled and howled. They clearly did not like being left behind while their teams moved down the trail without them. As pack animals, they long to be with their clans. The boys asked Monica about the race and how she felt about it. She is deservedly proud of herself and the team for getting to Nome. That was her original, ultimate goal after all! 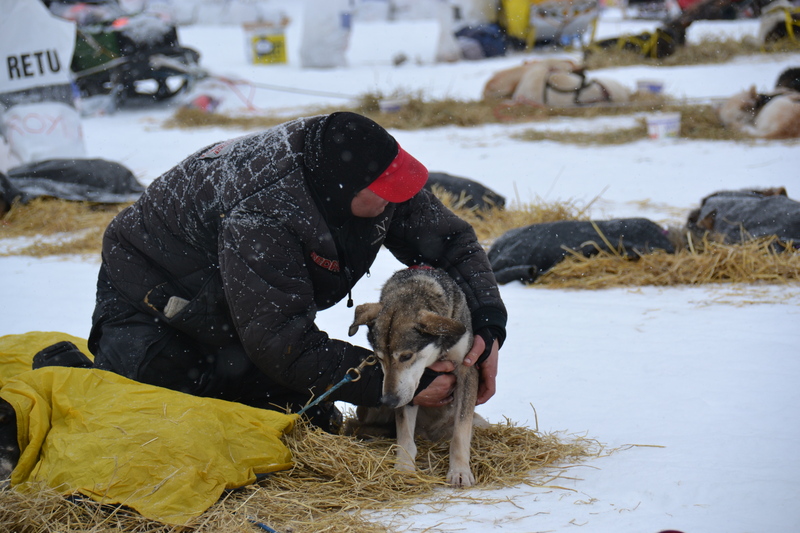 She said she took her time at the beginning because she was concerned about the lack of training they were able to do and with such young dogs she didn’t want to push it to hard too fast. She felt that had she had the chance to do more training in better conditions, the team would have been able to move faster. But, she also pointed out; there is always the risk of training too much. Training too much means that the dogs are bored of running and they don’t have the excitement or the drive to get down the trail and see what is around the next bend. Our socks were a hit! If you remember, we had a fundraiser to buy warm wool socks to help Monica keep her feet warm! She says it wasn’t as cold as she expected it to be, but the socks and warmers were definitely used. What she really appreciated the most though was the encouragement notes we sent for her to include in her drop bags! She even sent them all home in her return bags so she would have them! 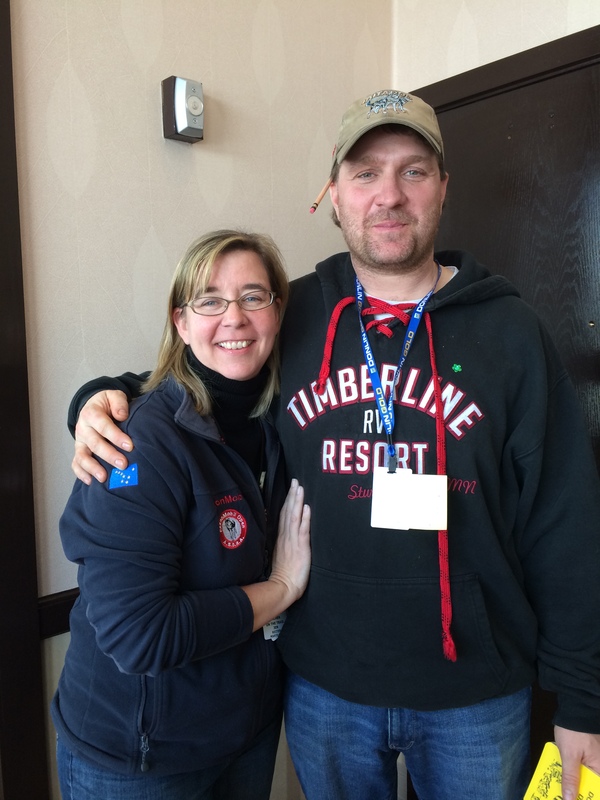 The most amazing story was that when she reached Unalakleet, she heard that Dallas Seavey had won the race. The note in her drop bag for that checkpoint said “You have done it; you have reached the three-quarter mark. You only have one more quarter of the race to go. I hope you have utilized Dallas Seavey’s strategy – sit back early and attack later.” Pretty amazing timing, right? As for her summer plans, she and Tim plan to keep training. In the summer they will use wheeled carts and give rides to passengers. This will help keep the dogs in shape physically and mentally. Mentally it will keep them used to listening to commands and working with people. Looking into the future and future races, Monica’s biggest wish for next year is for the snow to be better than it was this year! She is planning to run more races next year and is already looking forward to the Tustumena 200 which will be held in February in the Caribou Hills which is right in her backyard! She even mentioned that she’d like to do the Yukon Quest someday! Iditarod 2015? Well, she’s not committing yet, but she may, or maybe Tim will make another run! She says she’s a little intimidated by the southern route. Apparently, running the Yukon River on the Southern Route is a little harder because the winds become headwinds instead of tailwinds. We pointed out that we are pretty sure that if she could handle this year’s Iditarod she could handle any year’s Iditarod. 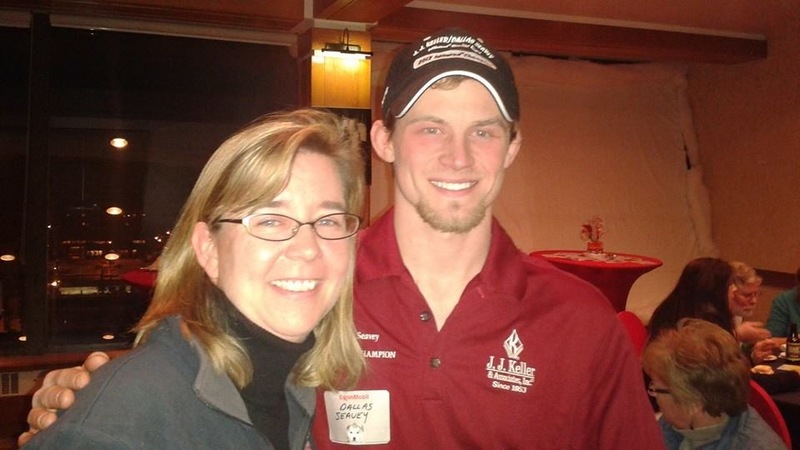 We are so grateful to Monica for allowing us to be a part of her race. She was amazingly generous with her time and we are so very proud of her for all that she has accomplished! Monica Moving to the Starting Line!